Bubbles are Now Bursting Across the Globe! It’s been a wonderful 7 years for stock market investors since the bottom in 2009. At least that’s what Wall Street tells you. In fact, Wall Street and all the advisors with conflicts of interest tell you that it will continue for many more years to come. The truth is that investors have pulling their money out of mutual funds at a record pace for those 7 years. And over the past two years, even the best and most seasoned hedge funds are seeing huge outflows, up to 65% of their investors’ money. But what do the investors do with that money? What is the alternative? And that’s where big mistakes are being made. Many put their money into junk bonds since they offered higher yields. Then, junk bonds plunged over 25% since 2013 to its bottom this year, certainly destroying much more value than the small incremental yields. Investors also got into all the MLPs (master limited partnerships) in energy, and then those plunged over 60% since 2014 to its bottom this past February. 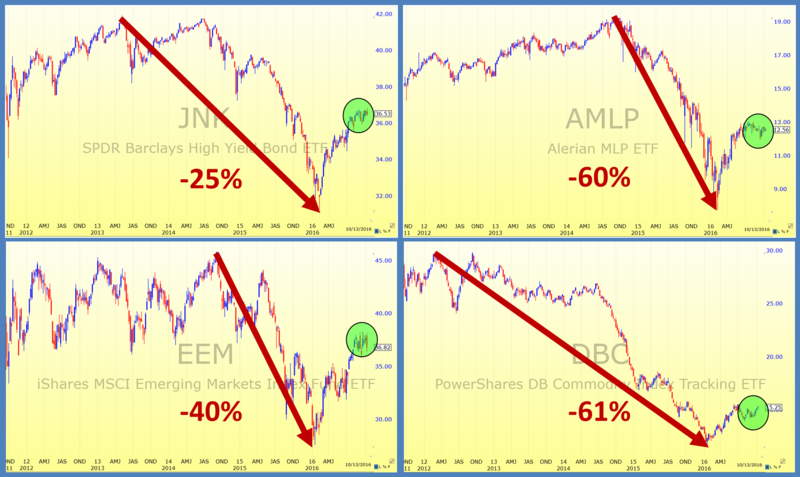 In the endless search for “alpha,” Wall Street analysts continued to recommend Emerging Markets as a profitable investment, but those markets plunged over 40% in 16 months. Even the commodity sector, which had been all the hype, plunged 61% over the past 4 years. More recently, investors tried real estate because it started booming. But now the hottest real estate markets in the US are plunging. Some like Miami, Manhattan, the Hamptons, Aspen, and Silicon Valley are reporting sales declines of as much as 50%-60%. Prices will soon follow this trend. Chinese investors got into their own stock market. Then the Shanghai index crashed 63% in 2015, wiping out over $6 TRILLION of wealth in a few months. The government created trillions of dollars of stimulus, which created an enormous bubble in the highly leveraged futures market in 2016. That has now crashed and been replaced with another real estate bubble. Asia’s other hot bubble markets are also crashing. And so it goes. 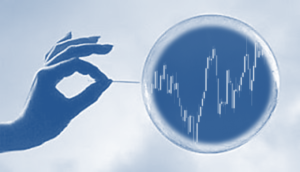 The central banks created a multitude of bubbles and don’t even admit it, or don’t recognize it. These bubbles are now bursting! Much Different Than The 2008-2009 Crash. The last crisis was based on subprime mortgages in the US and the deceptive paper instruments Wall Street created. These were sold to naïve investors and banks around the world. It was clearly fraud and thus imploded in 2008 just as we predicted in our book written in 2007, Prelude To Meltdown. Yes, there were only a few others who predicted the financial crisis. No one wanted to listen to us at the time. And now, we see eerie similarities in the current market environment, which is why we want to warn and help protect investors. Right now we have the major central banks of the world trying to prevent a collapse of the incredible global debt pyramid by creating even more debt. First they thought that pushing interest rates to zero would produce a recovery, but they failed. Now they are making the disastrous mistake of ‘negative interest rates,’ for the first time in 5000 years of human history. No one knows how this will play out, except that we are sure it won’t be a happy ending. There Will Be No Central Bank That Can Stop It. At Dohmen Strategies, we recently developed a unique and revolutionary service to help investors survive during the next crisis. The beauty of this service is that you don’t send you money to a stranger, wondering what he is doing with it. You are in full control of your hard earned money. Our business model at Dohmen Strategies is based on the success of our members. As we guide their investments safely and profitably in bull and bear markets, we earn their continued business. Look at the performance of our revolutionary HedgeFolios service just this year alone. Over the past 9 months, Wall Street has seen major hedge funds close because they couldn’t make any money for their investors. Yet, our model HedgeFolios, which members can easily replicate with a click of a mouse, brought enviable returns. (Of course, past performance is no guarantee for equal future results.) The returns were achieved without risky investments, and without options or futures. During the 2008 crisis, before our HedgeFolios service was developed, our affiliated investment and economic research firm, Dohmen Capital Research Group, gave advice via subscription services. During the worst part of the crash, six weeks between September and October, the 5 ETFs we recommended soared an average of 72%. Subscribers who followed our services were profiting as the markets were plunging, while most investors were losing their shirts following Wall Street advice on TV. Dohmen Capital Research Group will be 40 years old in January 2017. That’s almost a record in our field. To last that long in the investment field, you have to be good at what you do. In fact, we have forecasted every bear market during that time, usually when Wall Street was most bullish. With our revolutionary HedgeFolios service, we monitor the model portfolios for you throughout the trading week. When we deem an update to the positions is needed, we will make changes to the models and you will be sent an instant email notification. Then, all you need to do log in and, with just a click of the mouse, you can line up your own portfolio with our models. It’s really that simple. No matter how big your portfolio is, you pay one flat membership fee. There is no account minimum and we don’t even ask how much you choose to invest with. As a valued member, you get access to all five of our models, allowing you to choose to replicate one, a few, or all five HedgeFolios. It’s not too late to join! Not Taking Action Ahead of the Market Plunge. Join us today! We are always happy to speak with prospective members about HedgeFolios and how it can give you an advantage in the market. *Model performance: 12/31/2015 through 9/22/2016. Past performance is no guarantee of future results. Performance is based on our model Folios, provided by the third-party online brokerage firm that provides the platform for the model portfolios. The above performance is based on an unfunded model and does not constitute a composite for purposes of GIPS reporting. Model folio returns are calculated using the same methodology as funded folios–the Mid-Weighted Dietz Method. Performance may not always reflect the same returns of actual members as HedgeFolios is not a managed account program. The investor makes each ultimate decision on his/her own investments. Consult your investment advisor. Dohmen Strategies, LLC is not a registered investment advisor. For complete information on the HedgeFolios program, visit www.hedgefolios.com.